Japanese garden landscaping is an incredibly beautiful and interesting way to style a garden. This branch of our hobby is becoming very popular in the west and the history and elements behind the Zen garden is a fascinating story. The Zen Garden originated in the Far East in the country of Japan. 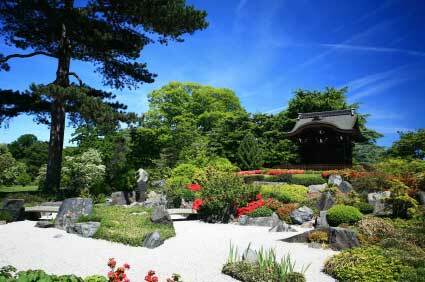 The first Zen gardens were perfected and landscaped by Japanese Samurai warriors who were Zen Buddhists. Their faith dictated that the way to enlightenment was through a simple and humble life. The gardens were developed by Zen Buddhist priests who sought to demonstrate a form of landscaping which exemplified their ethos of humility while demonstrating the power of nature. An essential factor in any Zen garden is the concept of "Yin and Yang". Buddhists view them as complimentary forces and any Zen garden always contains a Yin and Yang element, though it is crucial to achieve some sort of balance between the two. 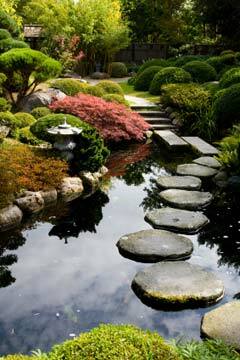 In any Zen garden landscape the most important natural elements are stones, sand, water and plants. Stones form the most important element in any Zen garden. They are a Yang element and there are strict rules as to their size and shape. They are also representative of islands and mountains and they are characterised by age and size. Stones which are vertical or horizontal are used in the design of a Zen garden and usually between three and five are used. Contrasting with the Yang of the stones, sand is the Yin. Gravel can also be used as an alternative to sand. And it can be light or dark, representing the gravel's Yang and Yin elements. The use of plants adds an air of aestheticity to the Zen garden. Pine trees are easily grown and are an integral part of many Zen gardens. Although being invasive the Bamboo trees also fit in comfortably with any design for the garden. A humid climate also allows for the use of moss. And a plant used to represent the circle of life in Zen garden designs is the Japanese maple. Water is believed to create an atmosphere of positive energy in Zen gardens so it is always included in the design. It is often seen flowing down the garden's waterfalls and represents the Yin aspect. There is plenty of open space, free from clutter, in a Zen garden, as it is meant to promote the flow of positive energy. Zen gardens have become a "must have" acquisition in the Western world. They fit in with current western thinking, being kind to the environment, healthy places to visit and are easy to maintain. They are also great places to relax, physically, mentally and spiritually. A miniature version of Zen gardens - small Zen Gardens - can be created in a box and placed in high stress environments such as offices.